After studying law and languages, Niloufar Bakhtiar-Bakhtiari made a career u-turn into the design industry. From a very early age she was submersed in the architecture and design world and always knew that this would be the sector in which she needed to work in to fulfil her ambitions. 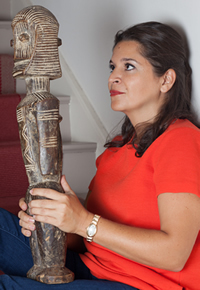 After an initial career designing furnishings and fabrics, Niloufar established her own interior design studio, NBB Design in 1999, specialising in the complete design, specification and implementation of exclusive interior and exterior spaces. A bespoke furniture design service for larger items such as beds, chairs, tables and cabinetry is also available. With a dedicated team of experienced builders and specialist suppliers, Niloufar has created a unique decorating style and a level of service that is unparalleled. Each project is treated on an individual basis and the architecture and location is duly considered. Niloufar believes in working closely with her clients to ensure their requirements are met and projects are delivered on time and on budget. For Niloufar, creating a comfortable yet functional home is a key aspect of her work. Our team of skilled interior designers handle all aspects of a design project from concept through to completion. Their experience and passion for design is visible in every project undertaken. Offering complete interior turnkey solutions for all elements of the design process and an exclusive, yet personal service, Niloufar and her team create exquisite interiors, delivered to an exceptional standard. Working with a network of trusted companies and experienced craftspeople for a number of years, we have established privileged relationships with many of our suppliers allowing us to work in harmony and for projects to be completed on time.